This book has been quite the hype among book bloggers. Almost everyone seems to have already read this book so when I found this among the shelves of the book store, I decided to pick it up and try it out. It had to be good right? I mean, everybody loved it so I should love it too, right? Eleanor is the new girl in town, and with her chaotic family life, her mismatched clothes and unruly red hair, she couldn’t stick out more if she tried. Park is the boy at the back of the bus. Black T-shirts, headphones, head in a book – he thinks he’s made himself invisible. But not to Eleanor… never to Eleanor. Slowly, steadily, through late-night conversations and an ever-growing stack of mix tapes, Eleanor and Park fall for each other. They fall in love the way you do the first time, when you’re young, and you feel as if you have nothing and everything to lose. Okay so the story starts out alright, the pace is pretty good and while I was reading comfortably, I wasn’t driven to read until the end. I only went through a few chapters before I put the book away for an entire week- and I was okay with that. 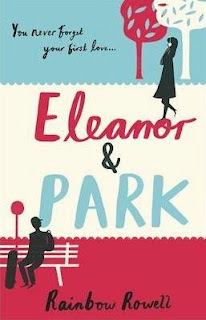 Just like the synopsis says, Eleanor and Park happens slowly and steadily. I knew I could leave the book and that nothing would happen. Putting Eleanor and Park (the book) down is like giving Eleanor and Park (the characters) a break. They’re not in a hurry for the story to continue and in fact, it seems like they prefer it if you read slowly. Most of the characters were really interesting. I liked the whole bus dynamic going on with Park, Steve and Tina, how the two of them seemed to support Park in their own little ways, especially towards the end of the book. I really like how they weren’t stable characters; people change the way they handle their relationships a lot during their teenage years and I felt that was very well done. I couldn’t even imagine what Eleanor looked like. First off, she’s described to be huge, wearing mens shirts and lots of red hair and freckles. I have no idea how to put all that together? There are moments when Eleanor describes herself and then Park describes Eleanor and I know they’re both biased descriptions because Eleanor will put herself down and Park is going to put her on a pedestal. So yeah, I had a little problem imagining Eleanor. I imagine Park as usual- an Asian guy who looks like all the other Korean guys who sing and stuff, thin and feminine looking, and I laughed when Park literally stood up in the book and knocked all that down. I love how the author called out on how we imagine Korean guys- all porcelain and girly. I’d give Eleanor and Park 3.5/5. I would probably not read it again, except maybe to get a few more quotes out of it/criticize more bits of it. I would, however, read more of Rainbow Rowell’s works.